There's still time to make a cute turkey lunch before Thanksgiving! 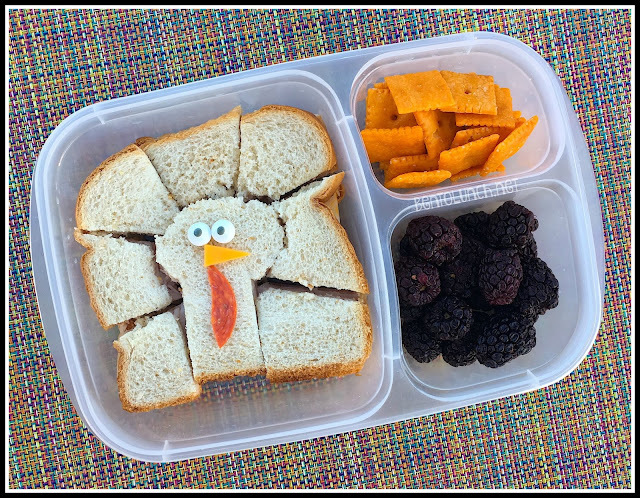 Unlike some of our creations, this one doesn't require special cookie cutters or a whole lot of skill--just a knife or kitchen scissors and a sandwich! And maybe some candy eyeballs. Both kids wanted a turkey sandwich, so I did have to make two of them. Get the turkey sandwich directions here. In the above, Faith took a ham and cheese turkey sandwich on honey wheat bread. With hers, I used mini candy eyeballs, along with a piece of pepperoni to make the waddle. Since I was low on cheese, I had to cut the beak out of the interior cheese, but the sandwich hid my cuts. To the right, she opted for animal crackers and grapes. 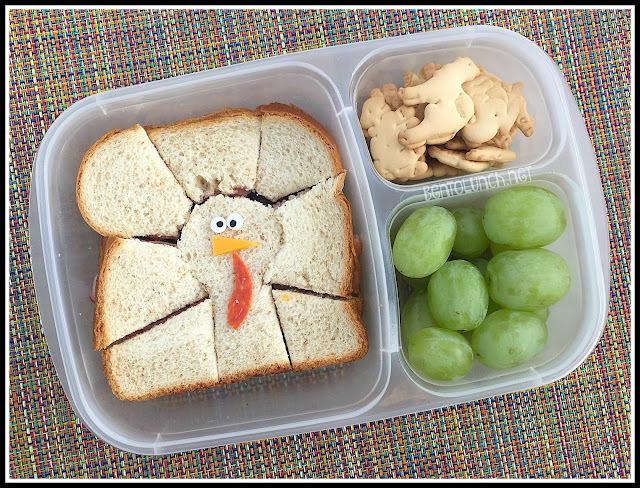 For Ben, he actually took a turkey and cheese turkey sandwich, also on honey wheat. The beak/waddle are the same concept as Faith's, but I tried the larger candy eyes on his to see which I liked better. His sides included cheese crackers and frozen blackberries, and probably a bunch of other foods. Both lunches are packed in our EasyLunchboxes.